Hi Loki! Happy Pet of the Day! 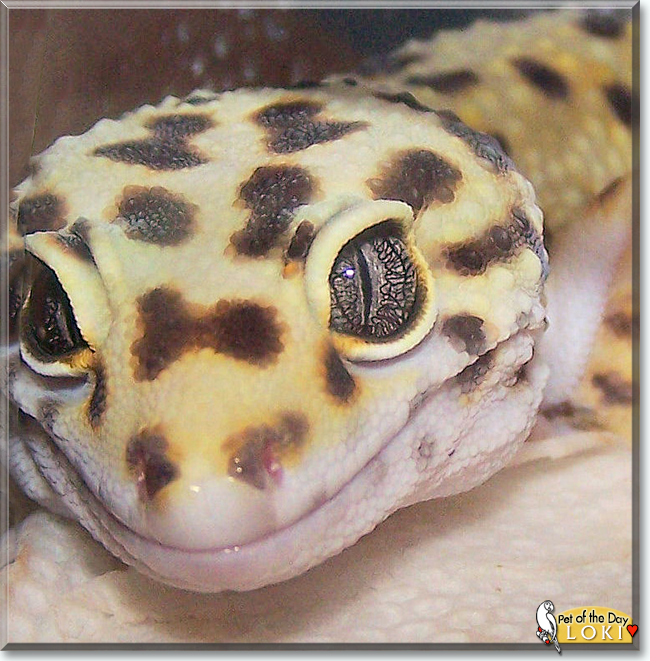 What a beautiful Leopard Gecko you are, Loki, precious beyond words! Just look at that trademark Gecko smile! Gets me every time! Now if only we could see that yawn! hehe Geckos make the sweetest companions and in you your human sure did hit the Gecko jackpot; the perfect "first;" best Christmas gift EVER! Your human is one lucky guy/gal, having a best friend as beautiful, as gentle and loving, as special as you, Loki! You're the best!!! Thanks for the BIG smiles, Loki! Meeting you today has been such fun! Hope you're enjoying a very special day of celebration...just chillin', lounging in your water bowl, lol; playing with your mom/dad, receiving tons of cuddles; being treated to all your heart desires and more! Lots of love to you, adorable Loki, our very special and most deserving Pet of the Day, EVERY day! You must have been the best Christmas present, ever. A happy boy that loves to smile. Dearest Loki, you are sweet indeed! (Maybe the very sweetest ever .) What a beautiful Leopard Gecko you are, so pretty with all those colors and that adorable face with the look as if you're smiling, and you probably are. You have the most delightful personality, too, and you make your dear person smile with your antics and energy. You and he/she love each other very much, don't you. What a wonderful love-filled home you share! Congratulations, darling Loki, on being chosen today's Pet of the Day! We hope you and your dear person and all your family and friends are enjoying a fine celebration, full of fun and lovies and all your favorite games and treats. Congratulations on being POTD handsome Loki!